The original sneakers were made of rubber and plain brown canvas. Until there were sneakers, which means until about 1917, a person’s footsteps always made a click or a clomp or a tap or a squeak. Before sneakers, the quietest shoes you could wear were Indian moccasins or Eskimo mukluks, but even they produced a muted thud on impact. Sneakers were the world’s first silent shoe. If you spun around fast on a basketball court, they would produce a high-pitched squeal, but essentially they provided stealth and surefootedness. They made it possible for a person to move like a cat. Sneakers owe their existence to the ingenuity of the Connecticut manufacturer Charles Goodyear. Mr. Goodyear ran into a bit of trouble back in 1839 while trying to make rubber coated mailbags for the U.S. government: the rubber turned sticky in hot weather and brittle in cold. When he retreated to the laboratory to work on the problem, one of the things Goodyear did was mix rubber with sulfur and then subject it to high temperatures. The result was what he called vulcanized rubber; it stayed elastic in all kinds of weather and could be bonded to other materials. According to some accounts, Goodyear’s achievement was purely accidental. If so, it was one of the most fortunate accidents in the history of American manufacturing. In the 1840’s, Goodyear came up with the first vulcanized rubber galoshes; in the 1870s, he made canvas-and-rubber tennis shoes that were an early version of sneakers. 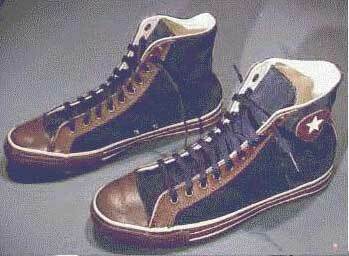 Actual sneakers, however, were invented by the conglomerate that bought Goodyear’s shoe company in 1892 — U.S. Rubber. Finding a name was no simple matter. U.S. Rubber’s first choice was Peds, but the name was unavailable. Three years later, the company narrowed the alternatives to Veds and Keds, neither of which meant anything at all. The nod finally went to Keds, because U.S. Rubber decided that K was the strongest letter in the alphabet (other U.S. rubber products have been named kraylastic, kraylon, Koylon, and Kedettes). In any case, the original high top Keds were made of rubber and plain brown canvas, and they extended to just above the ankle. They were not the least bit stylish: they wrapped the foot in a plain a package as you could ever hope to find. But the package worked, and its construction hasn’t changed in the last 50 years. Nor have all the high-tech Reeboks, Nikes, and Adidas managed to displace it in the marketplace. Twenty million sneakers are sold in the United States every year, the best seller these days being the Converse All Star. The classic American sneaker is still made from rubber and canvas. Kids in the inner cities call sneakers “limousines for the feet”, which puts it rather well. Sneakers are supremely comfortable and still the cheapest shoe you can buy. Since 1917, they have been essential footgear for generations of American children. Norman Rockwell’s paintings are full of them (which tells you plenty), and they have appeared in those rigorously all-American commercials for Coke, Levis, McDonald’s, and Pepsi. They are the footwear of choice for skate boarders and freestyle bikers. Bruce Springsteen wears them; Bill Cosby wears them. Woody Allen has even worn them with black tie. One out of ten Americans [definitely a higher number these days, Ed.] wears sneakers every day. And in England, where sneakers are known as plimsolls and brothel creepers, the fashion conscious Princess of Wales wears them, too.